It was supposed to be the war to end all wars and ended up with 18 million dead and just a few hundred yards gained for the allies. “It all seems rather silly, ” says young Raleigh in RC Sherriff’s Journey’s End. That doesn’t come close. Harrowing, tragic and profoundly moving, Journey’s End is Sherriff’s searing exposé about the senseless loss of life, a generation lost in the mud and trenches of World War I. Boys sent out to do a man’s job, full of the spirit of adventure, only to discover the bloody, brutal reality of combat. 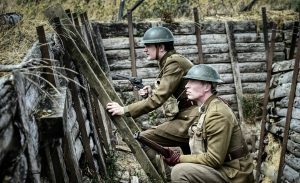 Immersion Theatre launched its 23-date, three month UK tour of Journey’s End at The Radlett Centre, Herts, last night and its bleak narrative has lost none of its power to shock. There are scenes that leave a profound effect. Anti war? Undoubtedly. 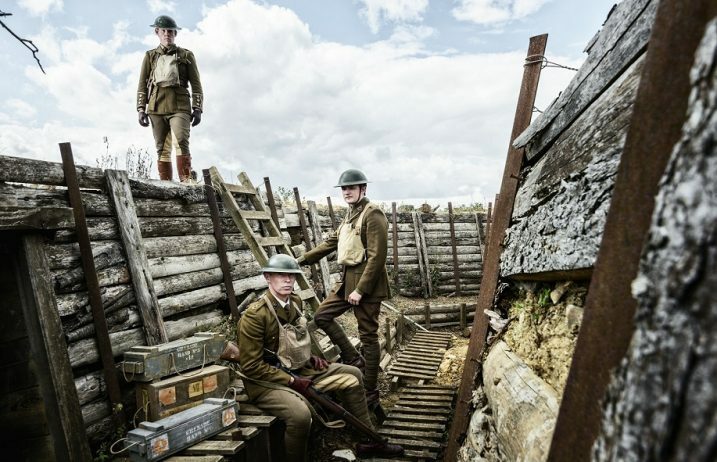 There’s a sense of the absurd about life in the officer’s dugout just a few yards from the Western Front – and only 60 yards from the Bosh in their trenches and tunnels. The men manning the wire, avoiding the two million rats scurrying at their feet, trench-foot caused by soggy socks, and whizz bangs sent over by the enemy, are surviving on starvation rations. Down below in the officers’ quarters their commander, the 21-year-old desperately fatigued Dennis Stanhope, knocks back a bottle of Scotch and rations of rum a day to numb his fears and insecurities. Meanwhile the chippy cook, Mason (Ashley Cavender), serves up culinary delights like meat-shaped cutlet, yellow soup and blancmange. At one stage there’s even a roast chicken and champagne – not that all the men can face eating it. A boy blunders down the steps and into the spartan headquarters where former teacher and a voice of reassurance, Osborne, known as Uncle to all and sundry, is sitting. Naive and eager, Raleigh (played with gut-wrenching authenticity by the superb Rory Fairbairn) is bursting with optimism. He’s going to be serving with his sister’s fiance, he’s going to have an awfully big adventure, and he can’t wait to get stuck in. He’s like a young puppy, bounding around the place, mimicking Osborne’s habits out of respect and admiration, in one touching moment. It can’t last. Fairbairn’s compelling performance, after Raleigh returns from facing the enemy for the first time, is intensely poignant, portrayed less through dialogue than by silence. Osborne is open, welcoming and full of wise words and maturity. Raleigh is astounded to discover he once played rugger for England. The other officers represent Sherriff’s own observations while serving in the Somme. Hibbert (Alexander Tol), wrecked with shell-shock, invents maladies in a desperate bid to be returned home; the jovial working class Trotter (a star turn by John Rayment) carries around a picture of his prize Hollyhock and entertains with jokes and anecdotes, while Hardy denies their predicament by making light of the situation. Everyone talks about their families, their civvy jobs, their gardens, anything but the sure and certain reality that it is unlikely that any of them will get out alive. Their courage, bravery and loyalty to a lost cause, is overwhelming. There are a couple of scenes that shine out. The first is when the fiery Stanhope has a furious confrontation with Hibbert, the latter trembling with nerves, terrified of leaving the dugout and unable to face battle. The second will move you to tears as one of the men is mortally wounded and dies in the arms of the man he respects and admires most of all. Immersion’s director, and artistic director, James Tobias, has successfully recreated the horror and futility of those awful times with the help of a fine cast of mostly company regulars. Silver-haired Matt Ray Brown, as Osborne, is an unlikely uncle, much less a father figure, but he turns in a moving performance that makes a major impact. When he’s told he must lead a suicide mission he knows that it is unlikely he will return. Yet he maintains his composure, takes out his copy of Alice’s Adventures in Wonderland and distracts himself, his calmness and stoicism never faltering. Tom Grace’s explosive anti-hero Stanhope is a 21-year-old officer forced to do a man’s job. He finds himself in command and having to disguise his own fears, usually with a good slug or two (though Grace doesn’t make an entirely convincing drunk). Occasionally the boy emerges. He asks Osborne to tuck him in during a rare moment when he naps, and his violent outbursts against his own men, usually during drunken rages, reveal a man simmering with rage, reluctant to be anybody’s hero or leader. Tim Peacock’s impressive sound effects pepper the two-hour play. They sound so authentic, the enemy mortars and bombs making the house shudder, that I almost felt that I was back at Ypres. My only reservation was the lack of atmosphere created by Tobias. The men make a big play about how quiet it is “before the final big push” – and it probably was – but, dramatically, the absence of any background noise, even a muffled mortar or the hubbub of men outside, made the set strangely cold and isolated. It was difficult to believe that we really were in a dugout on the Front Line. That niggle aside this is a top production, acted with real feeling and conviction. It’s a shame that, excluding two nights (tonight and tomorrow) at the Theatre Royal, Bury St Edmunds, the drama is only playing one-nighters around the country. This is the sort of show where audiences need time to grow in each location. 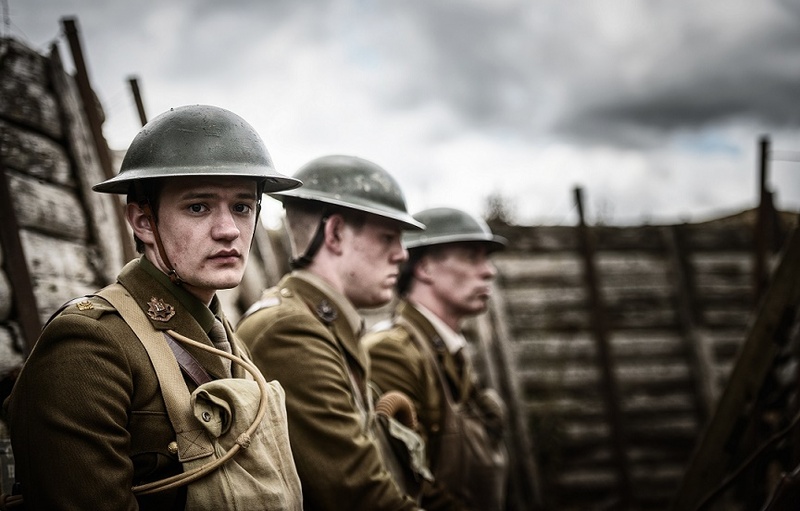 The futility and hopelessness of war is captured in Immersion Theatre’s compelling production of RC Sherriff’s powerful WWI drama, Journey’s End, now touring.